The BBC Proms in the Park is to return to Dundee for the second year in a row, it has been announced. The Scottish finale, due to take place on 10 September, will be held in the city's Caird Hall. The event will be hosted by BBC Radio Scotland's Jamie McDougall and Kaye Adams. Tenor Alfie Boe will be taking to the stage this year to perform with the BBC Scottish Symphony Orchestra. Recitalist Lisa Milne will also be featured. The Proms in the Park take place at the same time as the world-famous Last Night of the Proms in London's Royal Albert Hall. Other events have been confirmed in London's Hyde Park, Caerphilly in Wales and Northern Ireland. The Scottish finale to the BBC's Proms season had been held at Glasgow Green for six years ago before its move to an indoor venue in Dundee. 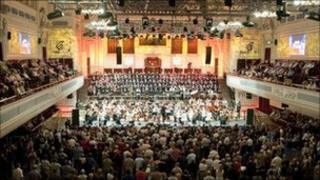 The BBC said the Dundee Proms Chorus would be making a return to the Caird Hall due to "public demand". Last year 200 aspiring singers were brought together for a special performance at the venue. Despite returning to Dundee for a second year, organisers said the event was expected to move to a different location next year.